For other ships with the same name, see INS Shakti. INS Shakti (A57) is a Deepak-class fleet tanker in service with the Indian Navy. She was built by Fincantieri, an Italian shipbuilding company based in Trieste. She is the second and final ship of her class. Shakti, along with her predecessor Deepak, is one of the largest ships of the Indian Navy. Construction of the vessel began in November 2009 and it was launched in October 2010. She was handed over to India by September 2011 and was commissioned on 1 October 2011. The construction of the vessel was completed in a record time of 27 months, after the contract worth €159.32 million was signed in April 2008. INS Shakti can refuel four ships at a time, with a fuelling speed of 1,500 tonnes per hour while her predecessors had a speed of 300 per hour. She is also equipped with state-of-the art electronics, medical facilities and storage spaces. According to Admiral Nirmal Verma, Shakti would significantly add to the Indian Navy's ability to conduct and sustain operations distant from the coast. INS Shakti has a length of 175 m (574 ft) overall, a beam of 25 m (82 ft) and a draught of 9.1 m (30 ft). The ship displaces about 27,550 tonnes (27,110 long tons; 30,370 short tons) at full load. The complement is about 200, including 20 officers. The ship is powered by two MAN diesel engines providing a total power of 19.2 MW (25,700 hp). This allows the ship to reach a maximum speed of 20 knots (37 km/h; 23 mph) and an endurance of 10,000 nautical miles (19,000 km; 12,000 mi) at 16 knots (30 km/h; 18 mph). To help prevent accidental oil spills the ship features a double hull configuration, in compliance with MARPOL 73/78. The Deepak-class tanker can carry 17,900 tonnes of cargo, including 15,500 tonnes of liquid cargo (water, ship and aircraft fuel) and 500 tonnes of solid cargo (victuals and ammunition). The modern cargo handling facility on board the ship enables transfer of heavy solid cargo via a 30 tonne capacity deck crane, and simultaneous fuelling of multiple ships at sea, and can refuel at the rate of 1,500 tonnes per hour. Workshop facilities on the ship can support other ships of the fleet and it is capable of supporting heavy helicopters. The ship has self-defence capability and is equipped with an indigenous anti-missile defence chaff system. On-board systems include fully automatic engine controls, power management and battle damage control systems. According to the navy, the ship was designed to operate as a command platform. The ship is fitted with four AK-630 Close-in weapon systems, which can fire at a rate of 4,000 to 10,000 rounds a minute. Fincantieri was awarded the contract to construct Shakti in April 2008, at a cost of US$300 million. The Deepak-class tankers were the first warships constructed for India by Fincantieri. The construction of the ship began in November 2009 at Fincantieri's Sestri Ponente shipyard in Italy. The sea trials started in December 2010. The ship was formally handed over to the Indian Navy on 23 September 2011, in under two years. Admiral Nirmal Verma, the chief of the Naval Staff, commissioned the tanker at Visakhapatnam, the home of the Eastern Naval Command, saying that the ship enhanced the reach of the navy well beyond the limits of the Indian Ocean. INS Shakti is the third tanker of the same name of the navy. The first Shakti had a displacement of 3,000 tonnes and was commissioned during World War II. She was in service with the Indian Navy from 29 January 1954 and decommissioned on 31 December 1967; whilst the second Shakti, a large ship built by a German yard, was commissioned on 21 February 1976 and decommissioned on 21 July 2007, after more than 31 years of naval service. INS Shakti replenishing USS Carl Vinson during Exercise Malabar 2012. Malabar 2012 In April 2012, Shakti took part in the Indian navy's annual maritime exercise with the US Navy, Malabar 2012, in the Bay of Bengal. During these exercises, the ship replenished USS Carl Vinson, flagship of the US Navy's Carrier Strike Group 1. South China Sea and the North-West Pacific In May 2012, Shakti, as part of a battle group of four ships, began a sustained operational deployment to the South China Sea and the North West Pacific Ocean. The other three ships were INS Rana, a Rajput-class guided missile destroyer, INS Shivalik, a stealth frigate, and INS Karmuk, a Kora-class corvette. This battle group was under the command of Rear Admiral P Ajit Kumar, Flag Officer Commanding, Eastern Naval Command. According to the Ministry of Defence, the two-month deployment, far from India's usual area of operations, along with naval exercises with a number of countries, aimed to demonstrate the Indian navy's operational reach. During the deployment, the battle group participated in passage exercises with the navies of the countries visited. The 'Passage Exercises' focussed on maritime security cooperation, which included humanitarian aid and disaster relief (HADR) operations and 'Visit, Board, Search and Seizure' (VBSS) drills for anti-piracy operations. These exercises aimed to increase naval inter-operability, enabling the two navies to function with enhanced coordination during possible HADR operations. In addition, during the port visits, the Fleet Commander along with the Commanding Officers of the ships met high-ranking officials of the navy, state administration, port management, coastal security organisation, police, and other stakeholders of maritime security in the countries visited, to share professional experiences and exchange best practices in areas of mutual interest. JIMEX 2012 The ship was deployed in the North West Pacific for JIMEX 2012 (Japan-India Maritime Exercise) with the four ship group, and took part in India's first bi-lateral maritime exercise with Japan. The Japanese Maritime Self-Defence Force (JMSDF) was represented by two destroyers, one maritime patrol aircraft and a helicopter. The four ships entered Tokyo on 5 June 2012 after visiting Singapore, Vietnam, Philippines and Republic of Korea. They stayed in Tokyo for three days. This visit coincided with the commemoration of 60 years of diplomatic relations between India and Japan. Vice Admiral Anil Chopra, Flag Officer Commanding-in-Chief Eastern Naval Command also visited Tokyo to witness the first JIMEX. South-east Asia After the deployment in the North pacific, the battle group was deployed in the South China Sea. As part of India's Look East policy, the ships visited the Shanghai port on 13 June 2012, for a five-day goodwill tour. INS Shakti served as the fuel and logistics tanker to the three destroyers. The ships left the port on 17 June 2012. Before leaving the port, the ships conducted routine passage exercise with the People's Liberation Army Navy. After the visits to Singapore, Vietnam, Philippines, Japan, South Korea and China, the ships visited Port Klang, Malaysia. This was the last port call of the battle group, after which it returned to the Eastern fleet of the Indian Navy, after being on a two-month-long deployment which started in May 2012. TROPEX 2013 Shakti was part of a seven-ship fleet which represented the Eastern Naval Command at Indian Navy's annual TROPEX exercise, which concluded on 1 March 2013. TROPEX 2013 was a month-long theatre level exercise which was conducted off India's west coast. The navy conducted manoeuvres, weapon firings and tactical evaluation. The other ships in the flotilla were the destroyer Rana, amphibious dock INS Jalashwa, corvettes INS Kulish, Karmuk and INS Sukanya, and it was led by INS Ranvijay under the command of Admiral Ajith Kumar P, Flag Officer Commanding Eastern Fleet. This flotilla made a port call at Kochi on 4 March 2013, en route to its forward deployment. South China Sea and Western Pacific The ship was part of a four-vessel fleet on a regular operational deployment to the South China Sea and the Western Pacific during May–June 2013, which departed from India on 20 May 2013. The fleet led by Rear Admiral Ajit Kumar consisted of stealth frigate INS Satpura, Rajput-class destroyer INS Ranvijay, corvette INS Kirch and Shakti, and carried more than 800 crew members. 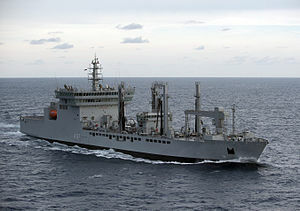 Shakti, along with Ranvijay sailed from Port Blair, Andaman and Nicobar on 21 May and were joined by Satpura and Kirch, which arrived from Singapore after participating in a maritime exhibition and a bilateral naval exercise. The ships made a five-day port call at Malaysia's Port Klang on 25 May 2013. The ships will conduct passage exercises and practice both conventional wartime drills and cooperative military action against unconventional sea threats with the Malaysian Navy. They will make further port calls at Da Nang in Vietnam and Manila in the Philippines. They are expected to return to India by June 2013. The fleet would be deployed in the South China Sea and the Western Pacific from mid-May to end June to reinforce military ties with ASEAN, in addition to showcasing India's naval capabilities. Western Pacific: In July 2014, an Indian Navy task force comprising INS Ranvijay, INS Shivalik, and Shakti visited the Russian Pacific Fleet at Vladivostok for Indra-2014 exercises. The Russian fleet consisted of guided-missile cruiser Varyag, the flagship of the Pacific Fleet; the destroyer Admiral Vinogradov, the Peresvet and several auxiliary ships, naval aircraft and helicopters. The exercise took place from 17 to 19 July in the Peter the Great Gulf in the Sea of Japan. The ships conducted tactical maneuvering drills, artillery and missile firing drills, as well as helicopter deck-landing drills. After exercising with the Russian Navy, the task force moved to the Pacific Ocean to exercise with the Japanese and the US Navy during Malabar 2014. Aircraft carrier USS George Washington and a nuclear submarine represented the US Navy, and the Japanese Maritime Self-Defence Force was represented by two destroyers, Kurama and Ashigara, and US-2 amphibious warfare aircraft. The harbour phase of the drills was conducted in Sasebo, Japan. Bay of Bengal: Naval ships Ranjit, Shivalik, Shakti and INS Airavat were readied by the Eastern Command to transport personnel and relief material as part of the rescue and relief mission during Cyclone Hudhud. INS Shakti entering Sattahip harbour in Thailand, 23 June 2015. Shakti deployed with other ships of the Eastern fleet to the Andaman & Nicobar Command, to exercise in the Andaman Sea and then deployed overseas to exercise with other navies of the region from Indonesia, Malaysia, Singapore, Cambodia, Thailand and Australia, as part of India's Act East policy. This task force sailed under the command of Flag Officer Eastern Fleet Rear Admiral Ajendra Bahadur Singh, VSM, who commanded from INS Satpura. The other ships in the task force were INS Sahyadri, the then-newly commissioned anti-submarine warfare INS Kamorta, destroyers INS Ranvir and INS Ranvijay and missile corvette INS Khukri. The ships make port calls at Jakarta (Indonesia), Fremantle (Australia), Kuantan (Malaysia), Sattahip (Thailand) and Sihanoukville (Cambodia). They exercised for four days with RSS Supreme and submarine RSS Archer along with fighters, patrol aircraft and helicopters of the Singaporean Navy from 24–27 May in SIMBEX 2015. ^ a b c d "Admiral Nirmal Verma, CNS commissions INS Shakti at Visakhapatnam". Indian Navy. Archived from the original on 25 September 2013. Retrieved 4 June 2013. ^ "INS Shakti launched at Italian shipyard". WN. Archived from the original on 24 December 2014. Retrieved 4 June 2013. ^ a b c d e f "INS Shakti commissioned". The Hindu. Retrieved 4 June 2013. ^ a b c d e f g "Indian Navy strengthens far-reaching capability". Sify. 21 January 2011. Archived from the original on 23 July 2011. Retrieved 2 February 2013. ^ a b c "Deepak Class Fleet Tankers, India". Naval Technology. Archived from the original on 28 May 2013. Retrieved 4 June 2013. ^ a b c d "Fleet tanker INS Shakti inducted into Indian Navy". DNA India. Archived from the original on 2 October 2011. Retrieved 4 June 2013. ^ a b c "INS Shakti inducted into the Indian navy". The Times of India. Retrieved 4 June 2013. ^ "Navy inducts fleet tanker INS Shakti". The Times of India. Archived from the original on 16 November 2011. Retrieved 4 June 2013. ^ a b "INS Shakti launched at Italian shipyard". The Deccan Herald. 11 October 2010. Archived from the original on 25 December 2014. Retrieved 29 July 2012h. ^ "Navy boosting Eastern flank". New Indian Express. 31 December 2012. Archived from the original on 23 December 2014. Retrieved 14 January 2013. 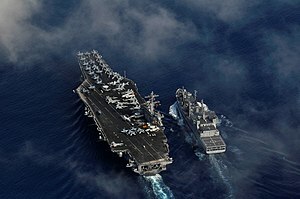 ^ "Carl Vinson Sailors Make History During Exercise Malabar 2012". US Navy. Archived from the original on 15 May 2013. Retrieved 14 July 2012. ^ "India's Navy Good U.S. Option". The Diplomat. Archived from the original on 20 July 2012. Retrieved 2 August 2012. ^ a b c d "First bilateral maritime exercise between India and Japan" (PDF). Indian Navy Press Release. 9 May 2012. Archived from the original (PDF) on 9 January 2014. Retrieved 17 January 2013. ^ a b c Mohan, C Raja. "Analysis: Japanese Navy". Observer Research Foundation. Archived from the original on 15 April 2013. Retrieved 17 January 2013. ^ "India, Japan to hold first naval exercise from today". IBN Live. 9 June 2012. Archived from the original on 3 September 2013. Retrieved 14 January 2013. ^ a b "How Indian Navy is expanding and modernising". NDTV. June 25, 2012. Archived from the original on 7 July 2012. Retrieved 14 July 2012. ^ "Japanese warships call at Kochi". The Hindu. 15 June 2012. Archived from the original on 3 March 2018. Retrieved 17 January 2013. ^ "Warm reception to Indian naval ships in China". Zee News. June 13, 2012. Archived from the original on 14 August 2012. Retrieved 14 January 2013. ^ "Indian warships to dock at Chinese port". Zee News. 12 June 2012. Archived from the original on 3 March 2016. Retrieved 14 January 2013. ^ "Indian warships to dock at Chinese port after 6 yrs gap". Hindustan Times. Archived from the original on 3 January 2013. Retrieved 4 June 2013. ^ "Indian warships wrap up China visit". NDTV. 19 June 2012. Archived from the original on 20 June 2012. Retrieved 29 July 2012. ^ "Chinese Navy calls for trust building with India". The Hindu. June 15, 2012. Archived from the original on 19 July 2012. Retrieved 3 January 2013. ^ "Chinese Navy calls for trust building with India". THE WEEK IN REVIEW. IDSA. Archived from the original on 3 March 2016. Retrieved 3 January 2013. ^ "Indian warships on goodwill tour, dock in Malaysia". NDTV. 28 June 2012. Archived from the original on 15 August 2012. Retrieved 29 July 2012. ^ "Indian navy ships on 4-day visit". New Straits Times. 28 June 2012. Archived from the original on 2 July 2012. Retrieved 29 July 2012. ^ "Indian Navy Eastern Fleet heads back after Exercise TROPEX 2013". Frontier India. 7 March 2013. Archived from the original on 11 July 2018. Retrieved 4 June 2013. ^ "Seven warships of Eastern fleet depart after 4-day visit". Business Standard. 7 March 2013. Archived from the original on 5 June 2013. Retrieved 27 May 2013. ^ "Seven warships of Eastern fleet depart after 4-day visit". Zee News. 7 March 2013. Archived from the original on 16 January 2014. Retrieved 27 May 2013. ^ a b "Indian Navy Warships Call On South-east Asia". Bernama. 29 May 2013. Archived from the original on 22 February 2016. Retrieved 29 May 2013. ^ a b "Naval fleet goes on a month-long expedition". Deccan Herald. 29 May 2013. Archived from the original on 17 February 2016. Retrieved 29 May 2013. ^ "Indian warships makes port calls in South-East Asian nations". Business Standard. 26 May 2013. Archived from the original on 22 February 2016. Retrieved 27 May 2013. ^ "Four Indian navy ships dock in Port Klang Read more: Four Indian navy ships dock in Port Klang". New Strait Times. 26 May 2013. Archived from the original on 26 May 2013. Retrieved 27 May 2013. ^ "Indian warships to visit Vietnam". Thanhnien News. 28 May 2013. Archived from the original on 15 June 2013. Retrieved 29 May 2013. ^ "Four Indian warships on overseas deployment to the east". The Times of India. 28 May 2013. Retrieved 28 May 2013. ^ "Russia, India to Hold Naval Exercises in Sea of Japan". Sputnik News. 11 July 2014. Archived from the original on 24 May 2015. Retrieved 23 May 2015. ^ "Indian warships in Russia for naval wargames". Zee News. 14 July 2015. Archived from the original on 24 May 2015. Retrieved 23 May 2015. ^ "India, US, Japan to hold naval wargames in Pacific Ocean". The Economic Times. 23 July 2014. Retrieved 24 May 2015. ^ "Cyclone Hudhud: Visakhapatnam's naval base takes a battering". The Times of India. 13 October 2014. Archived from the original on 3 March 2018. Retrieved 24 May 2015. ^ "Cyclone Hudhud: Evacuation pays off, casualties minimal". The Hindu. 13 October 2014. Retrieved 24 May 2015. ^ a b "India sends four warships to the east, kicks off exercise with Singapore". The Times of India. 24 May 2015. Archived from the original on 26 May 2015. Retrieved 23 May 2015. ^ "Eastern Fleet ships visit Port Blair". Echo of India. 14 May 2015. Archived from the original on 18 July 2015. Retrieved 15 May 2015. ^ "Eastern fleet ships visit Port Blair". Andaman Sheekha. 14 May 2015. Archived from the original on 19 September 2016. Retrieved 15 May 2015. Wikimedia Commons has media related to INS Shakti (A57). This page was last edited on 24 January 2019, at 03:02 (UTC).